Question; Considering the divisive nature of politics today, the history of violent attacks against elected officials from both parties, and the drumbeat of the far left and far right calling for violence against elected officials and other dignitaries do you really think it’s wise to bury your head in the sand and ignore your security? To mitigate and address the threats ISA specializes in providing protective services and physical security programs for dignitaries, foreign delegations, elected officials, candidates for office and their families. Each program is tailored to the client’s specific requirements or threat assessment, and few protective and security service providers outside of Government and Law Enforcement can provide a more complete or customized program. Protective Operations; With the increased threat of politically driven violence by protest groups and violent extremists or “Lone Wolves”, as well as the threats from international and domestic terrorism, and organized crime, ISA ensures every protective service detail is staffed by fully trained and highly experienced diplomatic and executive protection agents who have formerly served with the US Secret Service, Department of State Diplomatic Security Service, US Military Protective Agencies, law enforcement and with fortune 100 Corporate Executive Protection Programs. Working in concert with national, state and local law enforcement, the ISA security detail will ensure our client can live and work in an environment free of fear allowing them to meet with constituents, hold town hall meetings, and do the work you were elected to do. For members of Congress returning home to your district, your ISA detail will be an asset assisting with transportation arrangements, coordinating with outside agencies, and providing you with enhanced communications. Physical Security; The safety and security of your home and office is paramount, your family and your staff should live and work without harassment or be exposed to violence. ISA physical security specialists working with our law enforcement partners will build a detailed threat assessment and prepare a plan to address the threats. Camera and access control systems, alarms and remote monitoring are just some of the resources available, and our consultants will ensure whatever our recommendations, they mitigate the threats and are financially responsible. ISA Threat Assesment; Experts will build protective and physical security programs that may recommend private or secure air and ground transportation, a top-level protective service agent or full detail, specially trained drivers, hostile surveillance detection teams, cyber and mobile IT experts, certified medical technicians and communication experts. But regardless of the recommendations, our goal is to mitigate threats and allow the clients to live, work, or travel without feeling as though they are restricted or unable to interact with others. We understand they have an important job representing the national interests of their countries abroad and need to be able to conduct business in a safe and secure environment. ISA has the resources, staff, and experience to not only provide full diplomatic security services but also language, media and advance specialists. Culturally aware and respectful of our clients, ISA also has the most restrictive non-disclosure agreements and highest vetting standards outside government, ISA agents and specialists can be trusted to provide daily operational security, as well as protection of intellectual property and information, and the highest level of discretion in the industry. For some help is available, for members of Congress, The House Sergeant At Arms wrote in a letter dated June 21, 2017, to the Federal Election Commission that he believes the FEC should issue guidance that would allow lawmakers to use campaign funds to pay for security systems in their homes. This was followed by Former Speaker Paul Ryan (R-Wis.) presenting to lawmakers that the FEC could issue blanket guidance allowing lawmakers to use campaign funds for their personal security measures. Note; Visit https://www.fec.gov/updates/ao-2017-07-use-campaign-funds-security-system/ for information on the use of campaign funds for physical security systems. On June 26th, 2017, A House panel approved providing an immediate $10 million for the rest of fiscal 2017, for Representatives to pay for an off-duty police officer or private security guard at town halls, fish fries, meet-and-greets or other public events in their districts. The House of Representatives also wanted $25,000 per member to hire private security right away to protect them in their home districts. If and when legislation and funding are approved ISA will be ready to support the security needs of members of Congress home in their districts. Democracy Under Threat; Government officials would like and deserve to eat a meal without being harassed, but as Press Secretary Sarah Sanders, Senate Majority Leader Mitch McConnell, Transportation Secretary Elaine Chao, former EPA Chief Scott Pruitt, Secretary of Homeland Security Kirstjen Nielsen and White House Advisers Steven Miller and Kellyanne Conway found out, that may not always be possible in today’s political climate. Each has been harassed in public, and with the speed of social media individual protestors have turned into protest groups very quickly. But these aren’t the only incidents involving members of the administration, Secretary of Education Betsy DeVos was chased from a D.C. public school by protesters Feb 10, 2017, and again Apr 6, 2017, on a visit to Florida International University. For other elected officials Rep. Maxine Waters of California on June 28, 2018, said “threatening messages” and “hostile mail” at her office, including “one very serious death threat” from an individual in Texas forced her to cancel two scheduled appearances in Alabama and Texas. 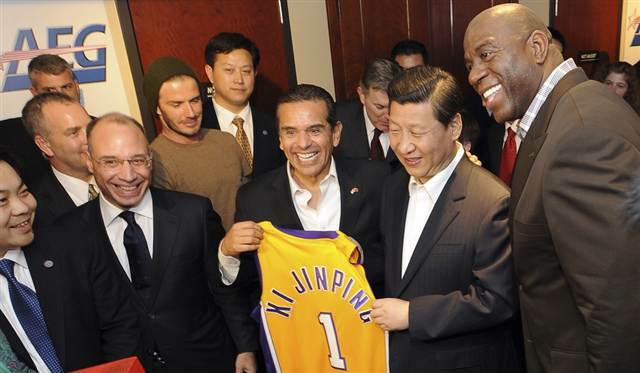 And the good congresswoman isn’t the only member to cancel public meetings and events with constituents. 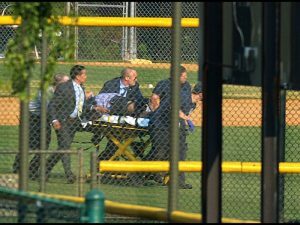 Democracy Attacked; On June 14th, 2017 the shooting of Steve Scalise, the majority whip of the House of Representatives a staffer for Rep. Roger Williams (R-Texas), and a member of Scalise’s Capitol Police security detail, on an Alexandria Virginia ball field, brought the question of the security, or lack thereof, of our elected officials front and center. 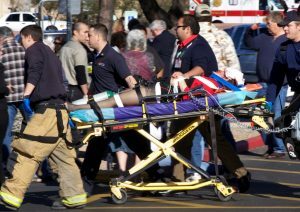 But this is not the first time a member of Congress has been shot, Gabrielle Gifford’s was attacked on January 8, 2011. She was shot in the head outside a grocery store in Casas Adobes, Arizona during an open-air event. In 2017 A number of lawmakers received death threats including Reps. Martha McSally (R-Ariz.) and Tom Garrett (R-Va.), from people angry about the GOP’s healthcare bill and President Trump, and Rep. Al Green (D-Texas), a member of the Congressional Black Caucus, after he called for Trump’s impeachment. 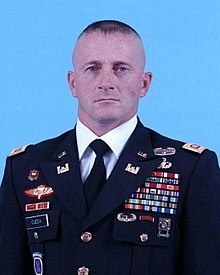 But its not just national political leaders, on May 9, 2016, Richard Ojeda, a military veteran who served in Iraq and Afghanistan and a Democratic candidate for the State Senate in West Virginia, was attacked a few days before the state primary while at an outdoors campaign event by a man he had known as a child. Kicked in the head until he passed out, he suffered fractured bones in eight places, including his eye socket and jaw. On September 11th, 2018 GOP Rep. 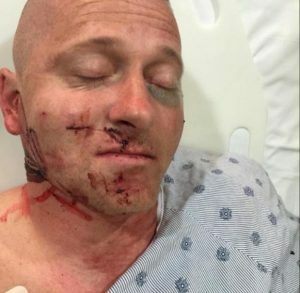 Candidate Rudy Peters was attacked in an attempted stabbing at a Fall Festival and in October 2018 a serial mail bomber sent explosive devices to two former Democratic Presidents, a former Democratic presidential nominee, a former vice president, two wealthy liberal campaign donors, two former top intelligence officials, a former attorney general, two senators, two congresswomen, and an activist actor. What makes that so troubling is the suspect Cesar Sayoc, 56. of Florida, was not known to the Secret Service as a threat to former presidents. A lone actor he was under the radar.